Kalaloch Lodge is located 3-1/2 hours from Seattle in Olympic National Park on Washington's beautiful and rugged west coast. No construction. Temporary traffic signals removed. Limited four-hour delays (9 a.m. - 1 p.m., Mondays through Thursdays only) and six-hour overnight delays (10 p.m. - 4 a.m., Mondays through Wednesdays only) may be scheduled and will be announced in advance. Learn more about this project including anticipated construction delays. Please visit the National Park Service website for up-to-date conditions. Elwha (Olympic Hot Springs) Road Closed to Vehicle Access: The Elwha area is closed indefinitely to vehicle traffic beyond Madison Falls parking lot due to excessive flood damage. There is limited parking and turnaround space at the Madison Falls parking area. Spruce Railroad Trail Delays (North Side of Lake Crescent): Trail work underway through mid-December. The trail is closed from the west end off Camp David Jr. Road/North Shore trailhead for one mile to the Daley-Rankin Tunnel. No through traffic. Find out more information on the National Park Service's website. Good news! There are no park entry fees to get to Kalaloch Lodge. Get a closer look at Kalaloch. 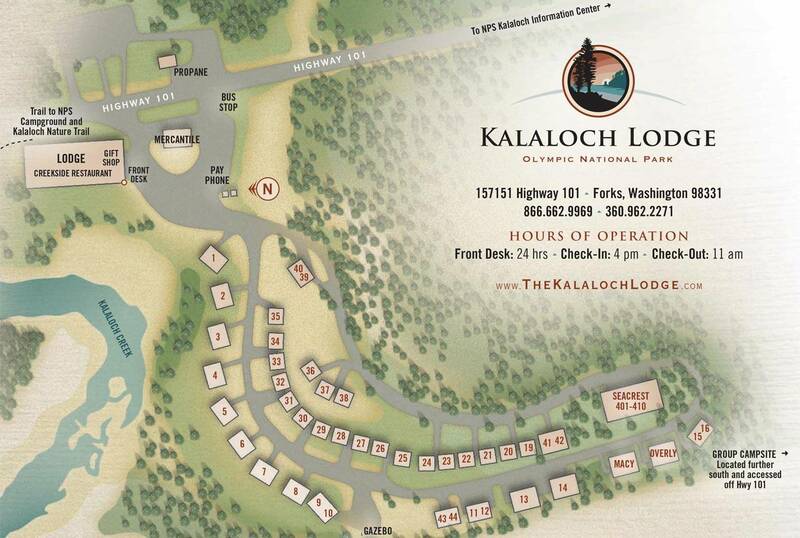 Download a property map of the Kalaloch Lodge grounds. Ferry service is available throughout most of the year between Victoria, British Columbia, and Port Angeles. The Coho Ferry offers vehicle and passenger service throughout the year, except for a two-week winter maintenance shutdown. The Washington State Ferry system serves a number of routes across Puget Sound, but does not provide service in or out of Port Angeles. The William R. Fairchild International Airport serves the greater Port Angeles area and is the closest airport to Olympic National Park. Rental cars are also available. You can also fly into Seattle's Sea-Tac Airport and rent a car (Kalaloch Lodge is about a three hour drive).